Are you struggling to show pastoral care of the sick? Do you get anxious when doing hospital visits? Do you feel awkward when you don’t know what to say or do when visiting someone from church? Do you wish you could get over the pressure of visitation ministry? Are you spending to much time worrying about your pastoral care to the sick? Do you feel like your seminary training has betrayed you? Do you feel like you don’t seem to be prepared for Christian caregiving? This book addresses my own fears and anxieties when I first started ministry and took on the responsibility of pastoral care of the sick. When I first started I wish I had some kind of hospital visitation manual or step by step guide. I used to be unprepared to visit anyone in the hospital. I didn’t know what to say, how long i will have to be there, when I will have to pray. It made me feel unqualified for ministry. I know the emotions and worries that strike someone who is called by God for ministry. I used to hate going on hospital visits. I felt no one taught me this real world ministry. This is when people are at their lowest and most vulnerable and I felt I used to be a failure for not being able to meet them where they are. In the end, thats what Jesus did for us. He visited and dwelt with the sick. He went to them and didn’t shy away. He cared for them so deeply. It is silly to think that what Jesus did so ceaselessly I would run from. It’s only a visit to the sick! That’s why I have put together this step by step hospital visitation manual. It’s going to equip you, inform you, and make you feel more qualified for visitation ministry. It is my intention to empower you for the pastoral care in hospitals God has called us to to. Hey Buddy!, I found this information for you: "The 15 Minute Hospital Visit: 7 Simple Things you Need to Know for Quick and Effective Visitation to Show Pastoral Care". 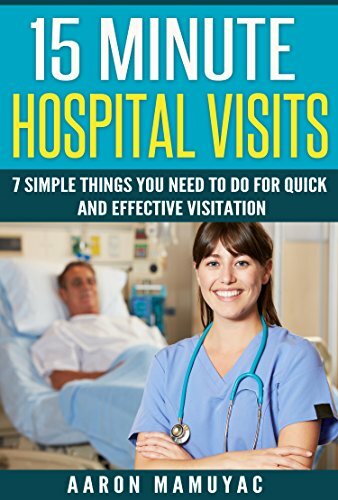 Here is the website link: https://christiansttshop.com/product/15-minute-hospital-visit-7-simple-things-need-know-quick-effective-visitation-show-pastoral-care/. Thank you.